I’m Seeing Spots, Blue Spots! Cue tip chalk is most commonly blue in color. This is because historically most pool tables are covered in green cloth. Blue works well for Standard Green, Euro Blue and Electric Blue Felt. 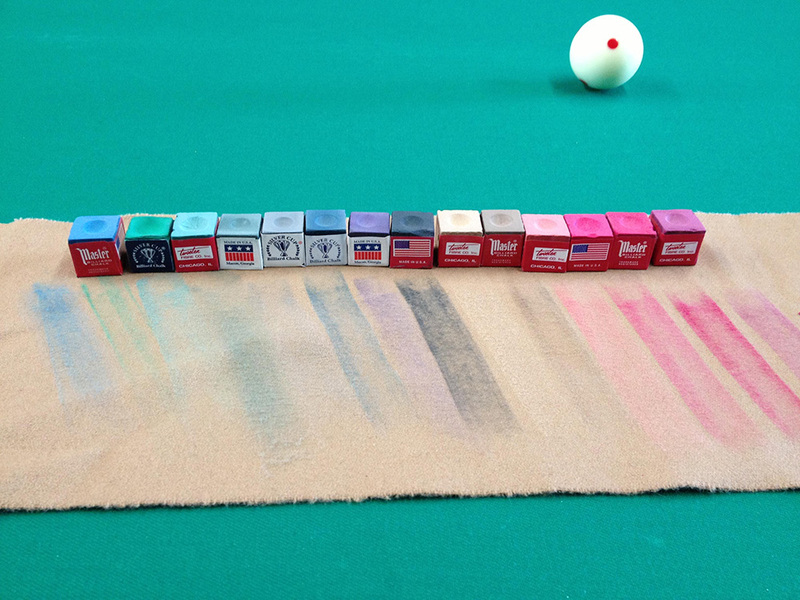 But, there are many different billiard cloth colors, and not all of them work well with blue chalk. When we recover a pool table with new felt, we do our best to not only provide you with matching chalk, but also track down all of the old pieces of tip chalk and remove them from the premises. Because it NEVER fails that someone finds a single piece of blue chalk left behind to use for a newly recovered table in Camel. But never fear, tip chalk comes in different colors. This is important to know, so that you don’t leave marks on your cloth. Using the wrong color, isn’t the end of the world though. A good pool table brush can brush away most of the excess, but some will still likely be visible. Visit us to find the right color chalk for your billiard table.